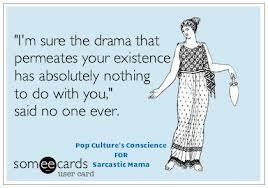 And for the love of all things sane, never , but never comment on one of their drama ridden spews about an ex or you will be doused in their verbal venom (especially if you have common sense as it eludes them). If it is a “friend” you can’t be arsed about casually delete them if you so choose. If it is a family member that you would rather not go through drama with at family reunions and gatherings, put them on ignore. This entry was posted in For The Love Of All Things Sane and tagged drama, drama whores, facebook. Bookmark the permalink. 1 Response to Drama Whores! Ugh, I wish more folks followed this rules. This is the reason I pretty much created a private Facebook to avoid all of the fools on my old friend lists…. Glad to see you’re back around!